The final leg of TNG — not counting the series finale — beginning with “Journey’s End” through “Preemptive Strike” revealed that the writing staff was at least contemplating the end of the series, with four of the last five regular episodes featuring notes that hinted at some character-related closure, albeit without making any drastic changes to the series’ status quo. 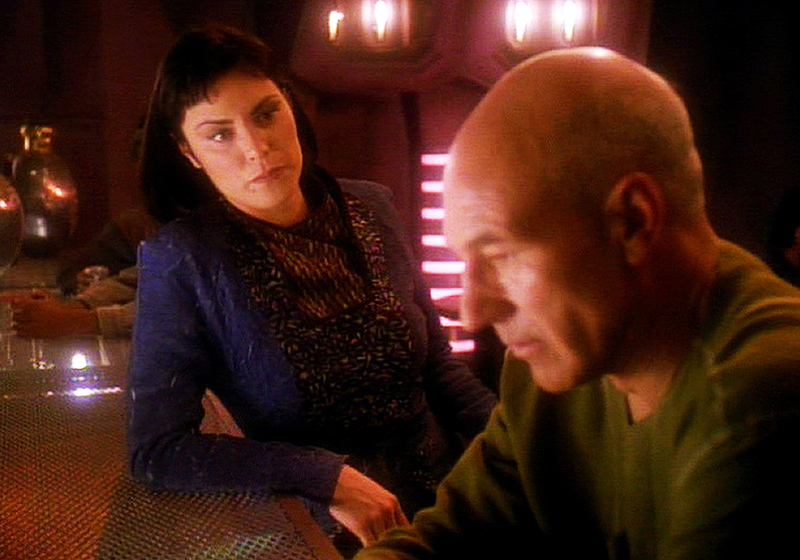 These episodes include a final check-in with Wesley Crusher; the last word on Worf’s son Alexander (until DS9 several years later); Picard learning that he might have a son when that possibility had been long ago been seemingly decided; and the fairly atypical (by TNG standards) turn of events surrounding Ro Laren. With the exception of that last outing, these episodes were middling endeavors that struggled to balance plot and character effectively. Then there was the odd man out of this particular leg, “Emergence,” which seemed more like it belonged in the previous run of weak episodes alongside “Masks” and “Genesis.” Perhaps the less said about it, the better. Anyway, dig in. My next post on TNG will wrap up this project with the two-hour series finale, which I think just about all of us can agree on. B-but what about Star Trek: The Animated Series? And “The Cage”? You’ve got to do those too, right? Then you’ll *really* be wrapped up! I’m messing with you. This has been an amazing endeavor and as a TNGer, it’s greatly appreciated! After ‘The Pegasus’ was filmed, 14 more TNG episodes were made, and yet I would personally only rate 5 of them as good/recommended to excellent. I include here Thine Own Self, apart from Lower Decks, Preemptive Strike and the final two episodes of ‘All Good Things’. 5 out of 14 good episodes for the final outings of TNG’s seventh series clearly shows that something was wrong with TNG. TNG in season 7 clearly went off the rails somehow and the producers did not maintain the quality of the show compared to its fifth or sixth seasons. Too many subpar shows were made. This is a puzzle since they still had many quality writers such as Naren Shankar, Brannon Braga and Ronald D Moore. Did TNG suffer from a loss of talent due to the start of the first season of DS9? I don’t know the answer. But something must have gone wrong for the producers to create such mediocre or mind stretching TNG shows such as Emergence, Firstborn, Masks or Bloodlines and then make a first rate episode such as Lower Decks or Preemptive Strike. Sometimes, it makes one wonder if you are watching the same TV series in TNG’s final season. People have to realize during the 1993-1994 season of TNG, there was the whole of the second season of DS9; the prepping and foundation laying of Star Trek: Voyager which was less than a year away; and lastly: the prepping and foundation laying of the 7th feature film, Star Trek: Generations (which was such a big event that it made the cover of Time magazine). To put it mildly: things were hopping and the creative talent was stretched thin. But, you know what? TNG season 7 and DS9 season 2 are miles ahead in quality of the last 2 seasons of VGR and all of ENT which ran by themselves (with the exception of Star Trek: Nemesis) between 1999 to 2005. What’s their excuse? The producers have been pretty open about the fact that they were all working on the Movie way harder than the series, with the exception of the finale. Read anything from Ron Moore. If they were already diverting time and creativity into Generations throughout season 7, then why on earth did it still end up so half-baked – to the point where they had mismatching uniforms and had to completely restructure the ending after shooting it? It was bizarre. It was because of the plot: getting Kirk and Picard to meet without time travel. That makes the framing device harder. So a temporal Nexus. What type of villain who looks human wouldn’t age during the 78 years in-between? An El-Aurian. One who’s obsessed with getting back into the Nexus and why? Because, as established in “Q Who?”, his world was destroyed by the Borg. After that, it was just a matter of working in all the plot elements that were never done in the series: destroying the Enterprise (an idea Brannon Braga had at the end of S6), giving Data emotions (foreshadowed in “Descent”), adding in some drama to make it more movie-like. Ron Moore probably came up with killing Picard’s brother’s family as well as Kirk’s ultimate fate. I bet I wouldn’t be too far off in figuring out who came up with what. There were going to be new uniforms for the film but they were scrapped at the last minute, so they fell back TNG and DS9 uniforms. The production reason was probably to see if both or either looked good on the big screen. The in-universe reason was probably because we caught in the crew in the middle of a uniform-switch. If you notice, the uniforms always changed from TNG to DS9 and not in the other direction. Excluding the very end where Picard was in a TNG uniform again after the point was rendered moot. They production team was working very hard on a film that was quilt-work. They also wanted specific elements in the film and had to do some mental gymnastics to get them to come together. With S7, I think the staff was just burned out and ready for something else. I’m a little sad. The years of waiting for Jammer to finally finish the reviews are almost over. It has been a fun journey and sadly, there seems to be no appropriate current series to go on with. Gareth, you nailed it, the problem with Generation was they had to Hit points A, B, and C, and leave screen time for each actor. There was nothing organic. It felt scripted. Now that being said, looking back at it after almost 20 years, it is kind of a fun movie. The characters all act right, the action moves pretty well, and it is actually pretty fun to watch! Ironically, what draws the movie to a complete halt is when Picard meets Kirk. Like the horse stuff. the only reason the stupid horse stuff is in there is because William Shatner loves horses. Honestly, I think the reason we as fans hate it is because the Kirk we all know and love would have gone straight to the Starship enterprise! Seriously, how much greater of a movie would that have been??? Picard finds Kirk on the Enterprise-A with all the old crew, and he has to convince him that it is more important to risk his life saving real people? In front of the imaginary Spock, McCoy, etc…. That would have been awesome. And as a movie going audience we would have forgiven the age conceit because we know they are old…..But we get the stupid horse and the love of his life….Antonia….That is all SHAT. BTW, I will through it out there that I also think Generations is the best looking film. Visually, I think it is stunning. I actually hate the enterprise-E. I think the D on the big screen was gorguous! The muted bridge was nice too. I just loved the look of the ship on the big screen!!!!! Sorry, dude.. you’ve got to start again with TNG. In Blu-Ray, it’s **stunning**!